We will be closed April 25 through April 30 for Holy Week and Pascha. We will resume shipping orders on May 1. 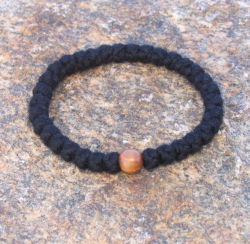 Simple wrist prayer rope with 33 knots and a single bead. Small (2-Ply Yarn) – For children and petite wrists. This is the thinnest yarn and makes the smallest knots. Each knot is approximately 3/16” in diameter. 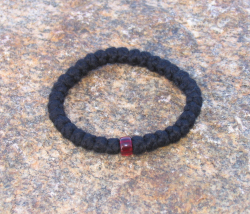 This prayer rope has an inside circumference of about 4 5/8”, but it will stretch significantly as it is worn and used. 2-ply is available in several colors. Medium (3-Ply Yarn) – This is the intermediate size of yarn and comes from Greece. Each knot is approximately 1/4” diameter. 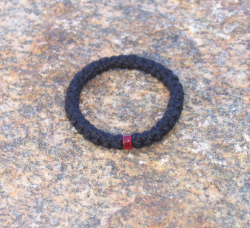 The prayer rope has an inside circumference of 6 1⁄2 - 7 1⁄4”, but it will stretch as it is worn and used. 3-ply is available only in black. Large (4-Ply Yarn) – This is the thickest yarn. Each knot is approximately 5/16” diameter. These prayer ropes have an inside measurement of about 7 1⁄4”. The prayer rope will stretch the first time it is worn. 4-ply is available in a variety of colors.